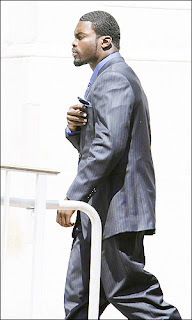 Michael Vick's sentence came down today. Apparently the judge is friends with Roger Goodell/a dog lover/both because he laid the smackdown on Vick to the tune of 23 months in jail. Now best case scenario, Vick gets out with good behavior in 19 months or so. Does he ever play in the NFL again? 1. Regardless of how long he's out of the league for, Vick is still an elite athlete. He can continue to go all Ed Norton in jail and work out and stay in shape. And if Ricky Williams has taught us anything, it's that there are teams that will try and give a shot to just about anyone. As long as Vick will take the league minimum, he'll be suiting up for someone. 2. Vinny Testaverde can only come back so many times (Can't he?). 3. The Oakland Raiders will still be around. If anyone would sign (and start) Vick, it's the Raiders. They would sign Hitler if he could run a 4.3 40. On that note, what position would famous people from history play? I could see Abe Lincoln being a pretty good wideout. But he'd have to watch out for Genghis Khan at linebacker when catching passes over the middle.